Hey guys, it’s Hannah and it is 2 o’clock in the morning and I’m wide awake. Welcome to my world. I’m thinking that it is the perfect time for me to do a video about insomnia and bipolar disorder. Insomnia and bipolar disorder, okay, this problem with sleeping that those of us with bipolar disorder have, it’s really, really difficult. Like this thing behind me, this bed, I really conflict with it. We have a love-hate relationship. I mean, the majority of the time, I am tossing and turning at night. I’m up and down, walking around. Sleep, unlike for other people, it’s really, really difficult for me. In the past, when I was untreated for bipolar depression, I would get physically ill due to the lack of sleep; mono, bronchitis. I got shingles once; which is something that usually people over the age of 60 get, just due to my lack of sleep and stress and not taking care of myself. I mean this isn’t something like you get 5 hours instead of 8. This is like you get two or one and it goes on for weeks. And I’ve talked about this a little bit in my “Hypomanic Hannah” video; which, if you haven’t seen it, subscribe to my YouTube channel and check it out. It’s about lack of sleep and how this is really a struggle for us. Sometimes, I’ll be laying in bed and it’s almost painful to shut my eyes. The time before bed, I’m stimulated. I just don’t want to go to sleep. And being that I’ve actually been hospitalized for lack of sleep, I really really had to change my routine up. And how I do that is I kind of have to chill out before I go to bed. And it’s really been a problem and I know a lot of people struggle with insomnia and bipolar disorder. 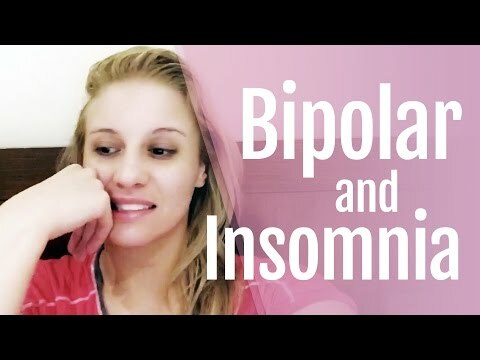 So please share your experience below in the comment section or do response video about the struggle between sleeping and living with bipolar disorder. I look forward to seeing those and I’ll see you next week. Bye you . Is Your Blood Pressure Too High ?